Our time with my beloved Durango is drawing to a close, and yet we’re still discovering new and wonderful features. The latest: Dodge’s inspired luggage rack cross-bar system. Below: Letter coding makes it a snap to mount and restow the crossbars. I avoid roof-rack use because it torpedoes the fuel economy, but desperate times call for desperate measures. We needed to move an IKEA kitchen to our cabin, where we’d spend a week assembling and installing it. Among the week’s necessities to be transported was a new Weber grill for our Independence Day cookout. It weighed half the 150-pound recommended maximum roof-top cargo limit, so it had to ride up top. 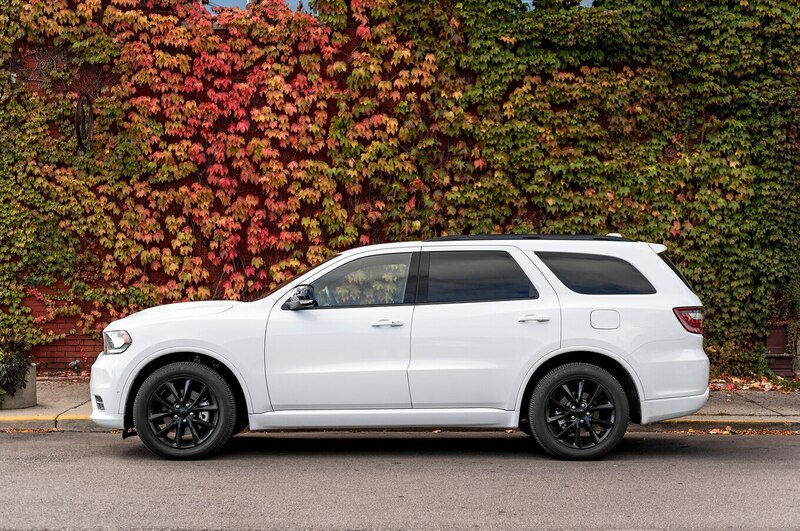 Most vehicles make you buy accessory crossbars to use their longitudinal rails, but the Durango hides two crossbars in the rails. It’s all part of the $395 Cargo Plus Group that includes the cargo area roller shade. You unscrew the crossbars, swing them 90 degrees across the roof, pivot their hinged ends down, line up the mounting points (clearly marked with letters A–D), slide them in place, screw them down, and voila! Ready to lash a grill to. These rails stay out of the airstream when not in use, but they’re always with you, should an impulse estate-sale purchase beckon. 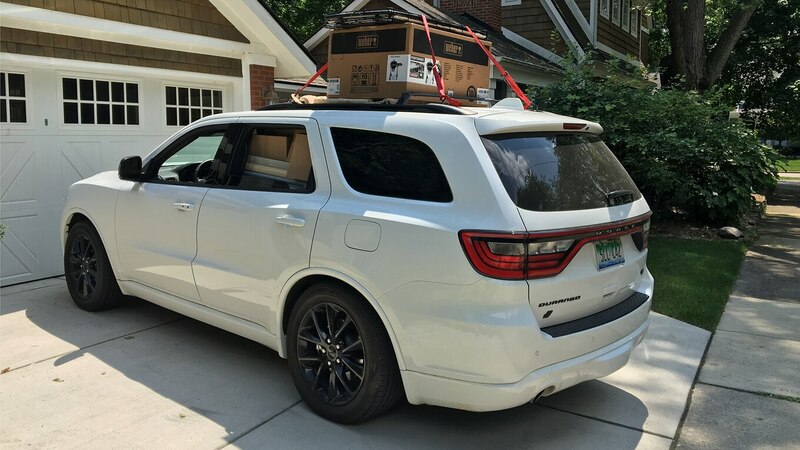 Fitting everything into and onto the Durango for this weeklong work-cation was a Tetris-like process that required an hour of loading, unloading, and reloading that still afforded Snickers (our dog) space to buckle into the right rear seat. We heeded the owner’s manual warning to slow down with a roof load because it was 97 degrees out, our overall load might have been an ounce or two over our Durango’s 7,100-pound gross vehicle weight rating, and I was in no mood to deal with a heat- or load-related tire blowout. Traveling at 60–65 mph we actually averaged slightly better fuel economy than the empty ute does at 80 (#SlowDownToSaveGas). Another load-hauling observation: I can’t tie the tailgate down when carrying a long load. With it up, an aggressive launch out into highway traffic sounds awesome but results in a big whiff of exhaust. 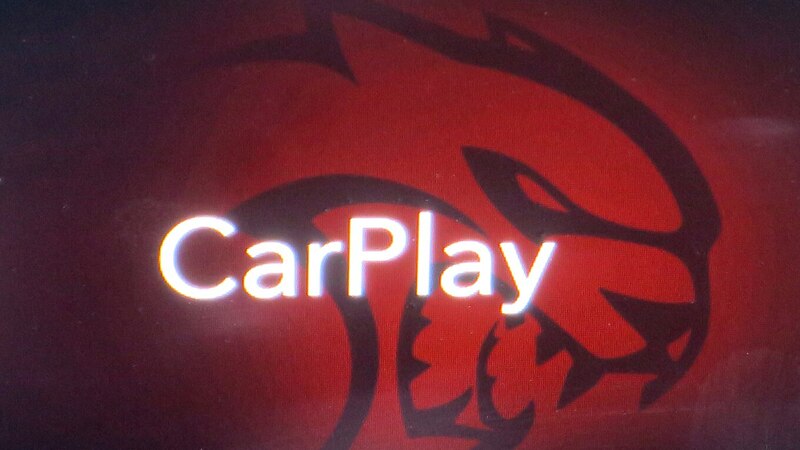 Our Durango R/T plays up its Hellcat heritage to let you know it’s game for any manner of car-playing, even before you plug in your iPhone. 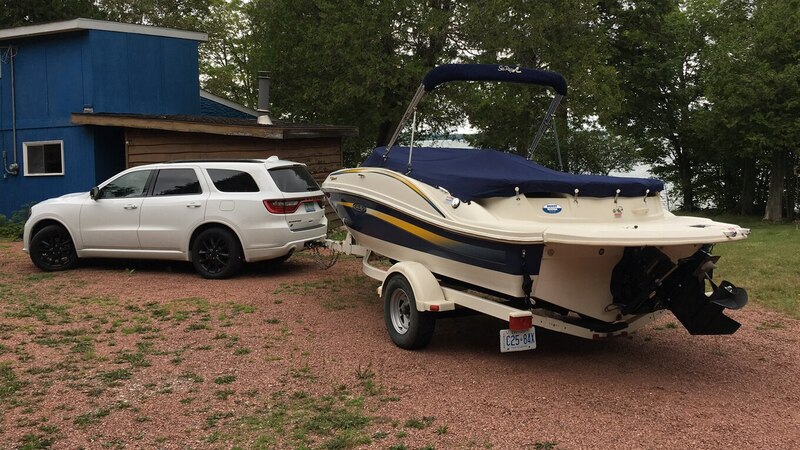 This week I’ve been playing with the Uconnect phone app, following Detroit editor Priddle’s vacation travels to her Canadian cabin, where she used the Durango to help deliver a pretty spiffy Sea Ray ski boat. It also shows me the odometer, tire pressures, fuel level, oil life, and vehicle health reports. I’ve resisted the urge to remote-honk the horn at 7 a.m. So far. During Detroit Editor Priddle’s summer vacation she found her literal dreamboat: An 18.5-foot Sea Ray bow-rider located 9 hours east in Ottawa, Ontario. The burly Hemi V-8 easily shouldered the load, though the cruise control had to drop a gear or two to maintain speed on some hills and the indicated fuel economy dropped about 5 mpg on the return trip. The post 2018 Dodge Durango 4 R/T Long Term Update 5: Like Sisyphus appeared first on Motor Trend. PS4 vs. Xbox vs. Switch: Which Console Won 2018? January 3, 2019 Comments Off on PS4 vs. Xbox vs. Switch: Which Console Won 2018?